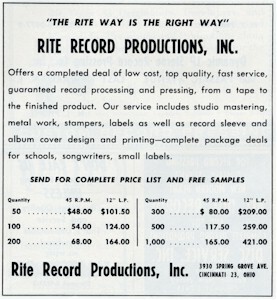 Originally named Gateway Records, Inc. and owned by Carl Burkhardt since 1950, Rite Records began offering a custom pressing program sometime in mid to late 1955. Carl was aware of the growing business KING Records was doing in custom pressings and decided to go after some of that business. Previously, they had only pressed their own releases (see Rite House Labels) which included Gateway Top Tune/Parade of Hits, Gateway Series, Kentucky and the extended play label - Big 4 Hits among other labels. The custom pressing work really took off around late 1958 when driven by Elvis Presley and rock n' roll, the record industry exploded in sales to teenagers. For one set price, 2 songs could be recorded in the Rite studio. They would then be mixed, mastered and pressed all in the same building. Depending upon the package purchased, the customer would then receive a predetermined number of records ranging from as few as 50 to 1000 or more. At 8000 records minimum, Rite's price was as low as nine cents each. Over a 30 year period, Rite pressed more than 21,000 different records! A CP- prefix (Custom Pressing) was used on the matrix numbers of all Rite custom pressings from 1955 until 1962 when it began to be used erratically. By the time the matrix numbers got up to 10000 it was almost never used. Eventually it was phased out altogether. As the CP - prefix was being phased out, the word RITE began appearing in the matrix as early as 1959 and appeared in all further custom work. Before RITE appeared in the matrix, the CP- number is the clue that it was pressed by Rite Records. In mid-1959 at the same time the word RITE began appearing in the matrix, a 3-digit number also began to appear to the right of the word RITE. This was an account number assigned to each company RITE was doing business with. I have included the account numbers in the database as it offers great insight into which labels were related to each other. Account numbers that are used for the first time are indicated with an asterisk *. Account numbers appear to begin with number 111 which belongs to Sterling Records of Boston, Massachusetts. Please note, there are many instances of existing record labels being assigned new account numbers over time so you can't always assume what a company's account number is for each release without looking at the matrix. I met with Carl Burkhardt at his home one day in 1990 and we discussed his memories of RITE Records for several hours. He also gave me what company records he still possessed at that time. (NOTE: This did not include any recordings although his house was full of reel to reel tapes.) Included in this material was detailed production information from late 1974 to the end of production in 1985. This information indicated that RITE matrix numbers were assigned to each project when an initial deposit was given by the client. From that point on, some clients were much more prompt than others in completing their studio work, label design and other decisions necessary for production to occur. Records were pressed as they were ready for production and not in chronological matrix number order. Many times, records that are in consecutive matrix order may have been completed and delivered as much as one to three months apart in real time. There are many cases of matrix numbers that were assigned to a project and then cancelled and never produced. In those cases, the matrix numbers were not reused and records do not exist for those numbers. For all of these reasons, I have listed the information below by year and not tried to break it down further by month. All numbers are approximate but fairly accurate until the beginning of 1975. Starting with 1975, all numbers are totally accurate. On May 27, 1981, and starting with matrix # 41933, RITE switched from consecutive matrix #'s for each side of a record to one matrix # with -A and -B denoting the two sides. This system remained in place until production ended in 1985.